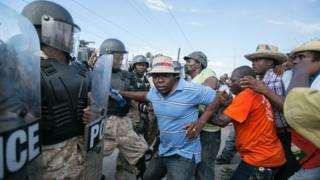 Protesters in Haiti have beaten a man to death in a clash with ex-soldiers, as political uncertainty continues. Witnesses say the crowd in the capital Port-au-Prince attacked the man, thinking that he was from the country's disbanded military. About 100 former soldiers, some armed, had been parading through the capital in pick-up trucks and on motorcycles. Haiti's president is due to leave office on Sunday but no successor is yet in place. A run-off election was indefinitely postponed last month after violence and allegations of fraud. The first round of voting saw President Michel Martelly's favoured candidate Jovenel Moise win a third of the vote, while opposition candidate Jude Celestin won a quarter. But Mr Celestin called the vote a "ridiculous farce" and opposition protesters denounced what they called an electoral coup. Critics of Mr Martelly fear he will try to stay in power or impose a transitional authority. The president has not given a clear indication of his plans. Last week he said he would not "leave the country in limbo" but he later insisted he did not wish to stay in power "for one extra day". Analysts say the looming power vacuum will discourage investors in the country, which is still recovering from a devastating earthquake in 2010. It has since relied largely on international donations and foreign aid. Haiti is the poorest country in the Americas, with 60% of its population living below the poverty line. Has the international community failed Haiti?